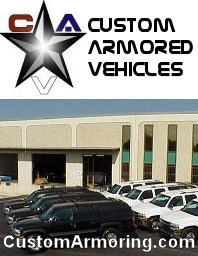 At Custom Armored Vehicles, we are known for the superior quality of our products. We use the latest in armoring technology to install materials of only the highest quality. High-hardened steel, reinforced fiberglass, ballistic nylon, and other advanced materials are used to create the unseen protection of our custom armored vehicles. Our superb quality of craftsmanship is evident in each bullet-proof vehicle we produce. Our vehicles are capable of achieving a defeat level up to 7.62 NATO armor-piercing ammunition while remaining indistinguishable from their original showroom appearance. "We are 100% committed to protecting the most important people in the world -- You and Your Family." 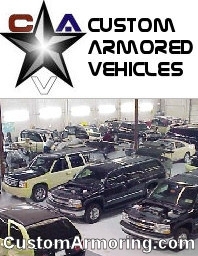 Custom Armored Vehicles is currently one of the largest providers of armored passenger vehicles in the world. We are dedicated to the protection of all of our clients whether they be government officials, corporate executives, religious leaders, industrialists, journalists, or celebrities. Our armored SUVs, sedans, trucks, limousines, and other vehicles have been protecting the lives of thousands of people throughout the world for the past three decades. Since 1975, Custom Armored Vehicles has been providing bullet-proof vehicles to numerous personalities in all parts of the world. We have armored more than 1,800 vehicles and have even had the honor of bullet-proofing the "Pope Mobile" for Mexico. All of our clients have seen the necessity to protect their lives and calm their fears with one of our custom armored vehicles. Don't you also deserve that same peace of mind? We offer better service, better quality, and better time of delivery.